With data lakes offering the means to capture, store and utilize a broad array of internal, third party and external data from a variety of sources, organizations of all types are ready to gain greater and better insights. While this promise of Big Data and improved visibility is substantial, data is pretty much useless if it can’t be trusted. The only way to be certain that your data governance policies are consistently followed and enforced is to ensure data quality across your IT systems. 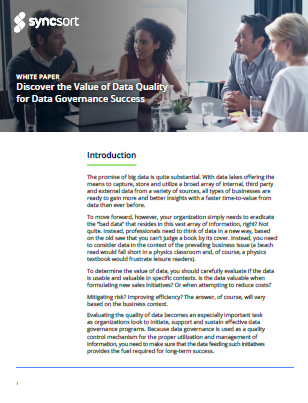 Download this white paper with Information Management, Discover the Value of Data Quality for Data Governance Success, to learn more about empowering your data governance program with quality data.